TallSkinnyKiwi: Did the Magi Wear Mullets? Did the Magi Wear Mullets? Another Christmas post from last year that I need to resize and repost. Here it is, and have a very mullet Christmas! 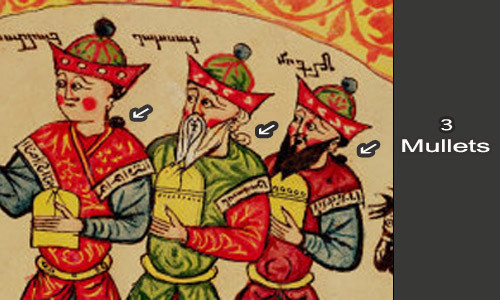 Were the Magi wearing mullets under their hats? Did the wise men from the east wear bi-level haircuts when they found the infant Jesus? Were the dudes bearing gifts of gold, frankincense and myrrh sporting a hairstyle that was, as David Spade would say, "all business at the front and party at the back"? I think YES! 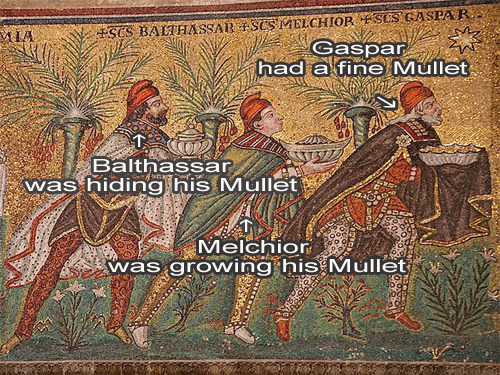 The Magi TOTALLY had mullets! And artists through the centuries have given witness. But don't just believe the artists. Bi-level hairstyles mullets were the preferred choice of Persian aristocracy and the wise men were representing the King of Persia. Makes perfect sense. "Magi", btw, is a Persian word that once defined the priestly class of Zoroastrian spiritual leaders who followed and added to the writings of Zoroaster. Later on it was used more broadly for other Persian religious leaders and mystical teachers. But the origin of the word certainly points to Persia. And Persia points to mullets for the upper class. Or in other words, anyone who was anyone in ancient Persia would not be seen dead without a mullet adorning their head. Ahhh, you say! Perhaps not! Since the Magi were Zoroastrian priests, their hairstyles may have been quite different to that of Persian royalty and aristocracy? And when you had gotten up off the floor, and composed yourself, I would add that the Magi who visited Jesus were not probably not strictly Zoroastrian. The true Zoroastrians were expecting a Saoshyant [world redeemer] born of a virgin in Persia, not one in Palestine. Not only that but by the time the Zoroastrian Avesta (holy writings] had been completed, there were prophecies that spoke of not just one but three distinct Saoshyants, all born of a virgin, and all born by a certain Iranian river. Besides that, even being purely Zorastrian would not discount the idea that the wise men wore mullets. King Darius the Great was both a Persian king AND a devout Zoroastrian - a worshipper of "AhuraMazda" [Lord Mazda] - and his hair was longer than Billy Ray Cyrus. Its hard to make out exactly how short Darius's hair was on top, since he was usually pictured wearing a royal headpiece. However, judging by the statues of Darius, I am quite certain that when he took his off headgear to let down his long braided hair, he would have boasted a mullet that would win trophies at the local tractor show! Also, the type of gifts given to Jesus by the Magi were the type of gifts typically given to kings. It seems obvious that these wise men were both spiritual and governmental leaders, representing their King and most likely wearing the kind of clothes and hairstyle [ie - MULLETS!] that their King would expect from his ambassadors. 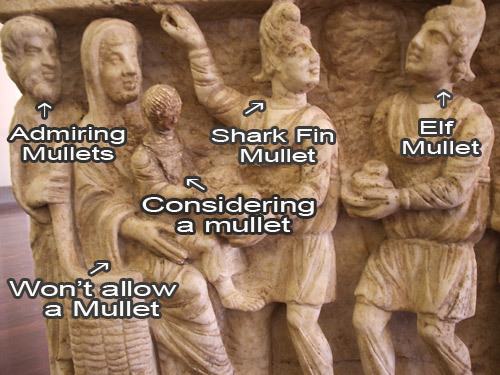 So yes, the Magi wore mullets. Friggin' "A" they wore mullets . . . and you can quote me on that! Hope this contributes a little towards a red-neck theology and that it inspires a new line of Christmas cards from Hallmark - cards that the rest of us can appreciate. 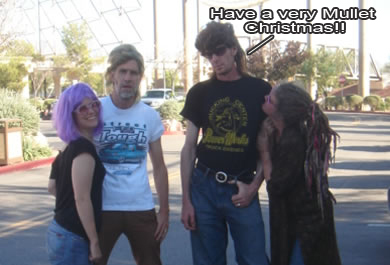 Have a very Mullet Christmas! 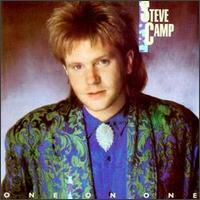 This blog post is dedicated to Steve Camp - musician, reformer, blogger, and former mullet champion.